Latest video on the human slaughterhouse that is Planned Parenthood. 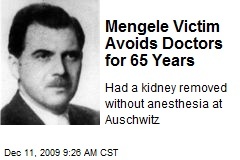 Josef Mengele was more humane than these evil butchers! O’Donnell also tells how her StemExpress supervisor instructed her to cut through the face of the fetus in order to get the brain. ““She gave me the scissors and told me that I had to cut down the middle of the face. I can’t even describe what that feels like,” she says.